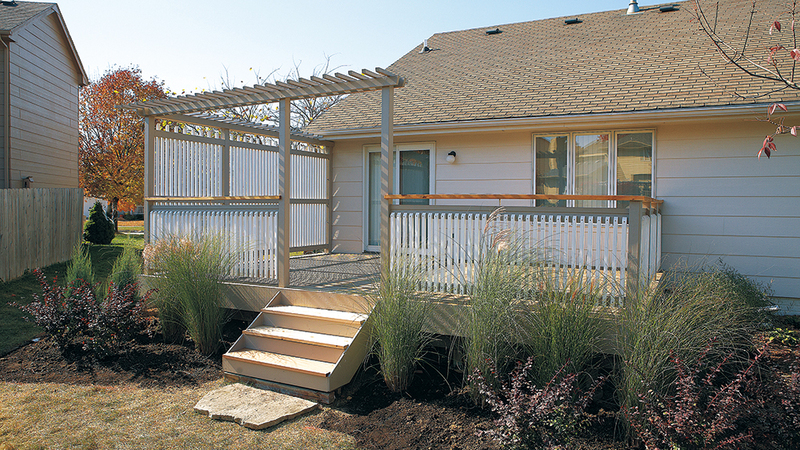 Building a proper planting bed is the first step in creating the perfect garden around your home. 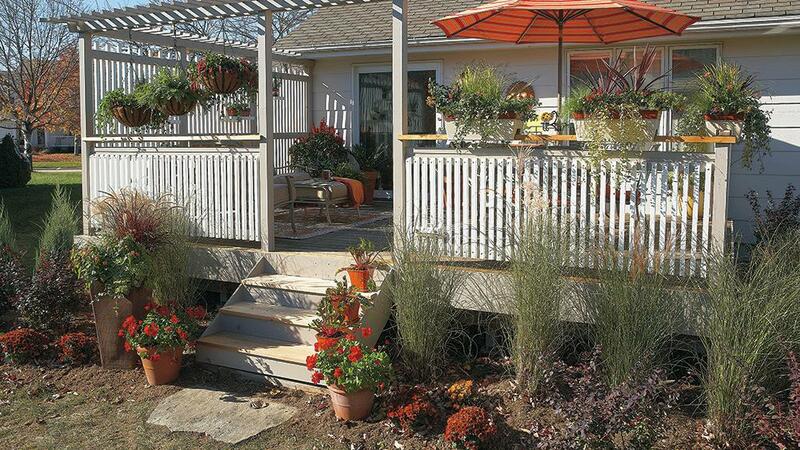 You can adapt for your own deck or patio with these 6 easy steps. Once it’s finished, you can relax in your own peaceful retreat! Working from a plan you’ve drawn on graph paper, measure out from the deck to mark points along the curves of the proposed beds. Then “connect the dots” with marking paint to show where the edges of the beds should go. 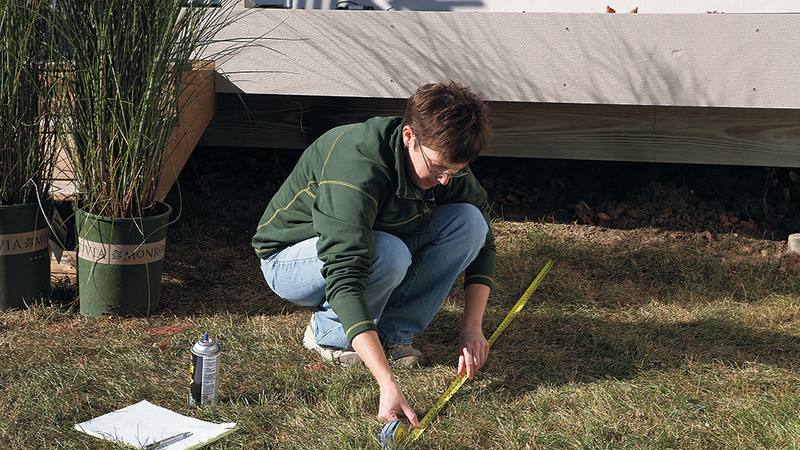 Before you start planting, you’ll need to strip off the sod inside the bed lines. Sod cutters are great in big spaces where there’s a lot of room to maneuver. 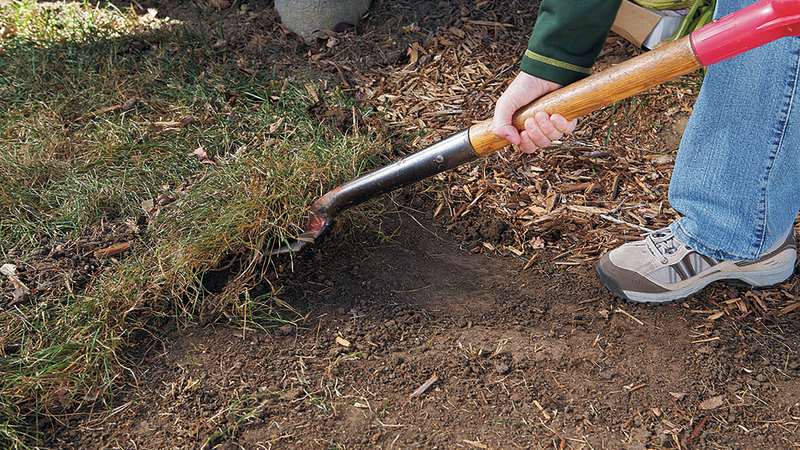 But in a small yard, or for creating small beds, it’s easier to strip the sod off with a spade. When you do this, it’s key to have a very sharp spade — you may even need to sharpen it a couple of times as you work. Strip off about an inch and a half of soil and roots so you don’t have grass regrowing in the beds. Patch holes in the lawn with the discarded sod, or toss it in your compost pile. The soil around newer homes like this one is often poor, but trying to amend the soil in an entire planting bed usually results in a pocket of good soil, completely surrounded by poor soil. When that happens, plant roots often circle in the good soil without growing out into the surrounding area, eventually causing the plants to be stunted. Water can also collect in pockets of good soil, essentially drowning the plants. 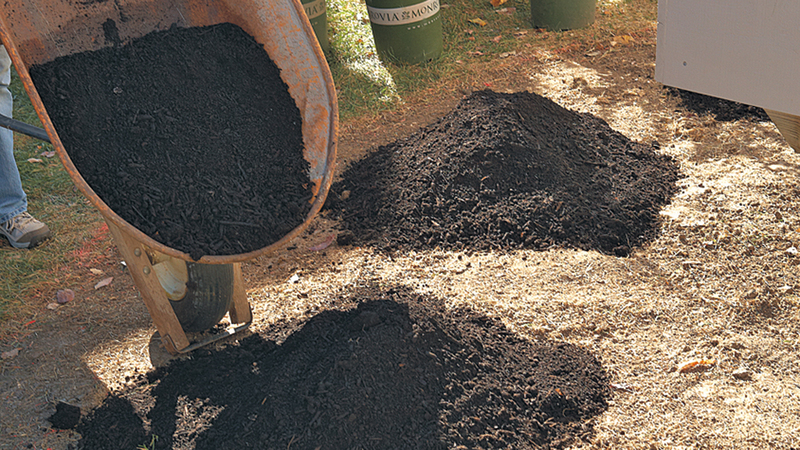 Instead, you can add a couple inches of compost to the surface, which will be incorporated as you dig each hole. That will add a little much-needed organic matter to the soil, but it won’t create those damaging pockets of better soil. When you’re planting in compacted or heavy clay soil like this, it’s best to dig more shallow planting holes than you’d ordinarily do. You want the top of the root ball 1½ to 2 in. higher than the surrounding soil, giving roots access to more oxygen. 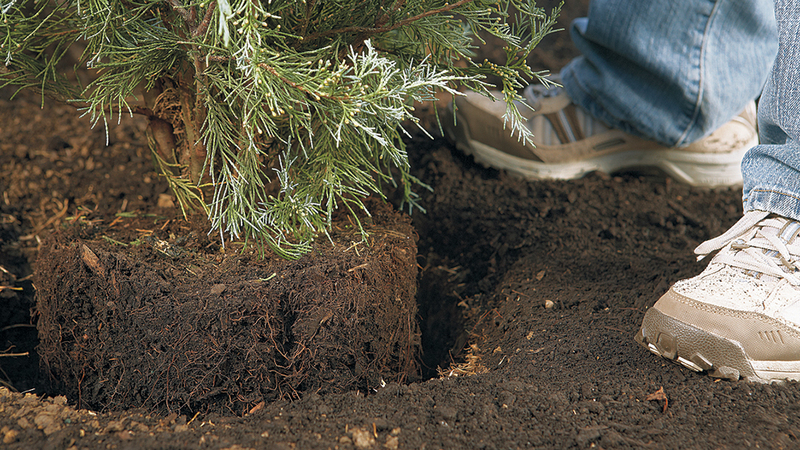 But you don’t want the exposed root ball sticking up, so mix compost and backfill soil to pull up around the edges of the root ball, sloping it down away from the base of the plant. Don’t forget to water as you plant! Pour a couple inches of water into the hole and let it soak in before you set the plant in it. Once the plant is safely in place and the soil is backfilled around it, water again to remove any air pockets and get the soil settled around the root ball. With the plants in place, it’s time to stop, step back and take a look at the bed. Of course, you can make changes later — plants are pretty forgiving! But it’s easier to adjust things before you spread the mulch. We tried out a flagstone step at the bottom of the stairs, and realized we’d need to strip off a little more sod so it was part of the bed instead of sticking out into the lawn. If it’s windy, you may find the newspaper easier to handle if you wet it with the hose or a watering can as you lay it down. Then spread 2 to 4 in. of mulch on top of the newspaper. 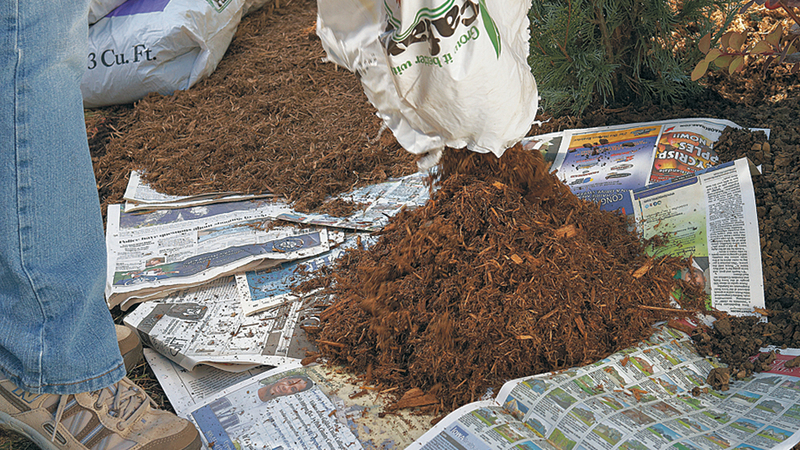 The layer of newspaper under the mulch blocks out light more effectively, which cuts down on weeds sprouting up in the bed. Most newspapers now use soy-based inks, so it’s safe to use them in your garden. Steer clear of the glossy inserts, though — some of those are still printed with petroleum-based inks, which you don’t want in your soil. (Besides, they’re slippery and hard to handle.) If you have access to corrugated cardboard, that works well under mulch, too, although it might be a little harder to adjust it around the plants. With everything safely tucked in, make sure all the plants get about an inch of water a week, and you’re on your way to a beautiful border.